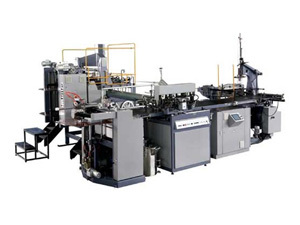 This RB6040 automatic rigid box maker (rigid box production line) is a kind of machine to producing luxury paper boxes for packing product such as shoes, shirts, jewelry, gifts, wine and so on. This processing equipment is advanced with fine design, reliable performances. With the adoption of PLC, photoelectric detector system, hydraulic system, HMI device, the rigid box maker (rigid box production line) can complete the whole process of feeding and gluing paper, conveying cardboard, forming and gluing four angles of cardboard, positioning and forming box in one time. 1. Adopt automatic delivery device for paper feeding. 2. It is hot-melting glue type, with automatic circulation, mixing and gluing system. 3. The hot-melting paper tape finish cardboard conveying, cutting, and finish pasting the inner box quad with four angles in one process. 4. There is vacuum suction fan under the conveyer belt can keep the paper from deviating. 5. Using hydraulic rectifying device for the paper and cardboard inner box for spotting correctly. 6. The Wrapping process device can continually delivery boxes, wrap, fold ears and paper sides form in one process. 7. This rigid box maker (rigid box production line) is adopted with PLC, photoelectric detector system, hydraulic system, HMI device. 8. Self diagnose troubles and show alarm accordingly. 1. The max and mini sizes of the boxes depends on the quality of the paper. 2. The production capacity is 35 boxes per minute, but the box size may be a factor. Founded in 2009, Shanghai Pripack Machinery Co., Ltd. has continually focused on providing a wide variety of paper bag making machine, hot foil stamping machine, flexographic printer, printing machine for customers around the world. We are very familiar with international market of laminating machine, hot foil stamping machine, printing machine, paper coating machine and its trend of development. With products of high quality assurance and CE certificated, we are sure to provide our customers with the best products at competitive price.